FORT WORTH, Texas — After a 76-race absence from victory lane, Matt Kenseth needed a quick refresher course. That it had. Kenseth’s NASCARSprint Cup Series winless streak dated to February 2009, when he won the Daytona 500 and the second race of the season at Fontana, Calif. — and nothing after that. 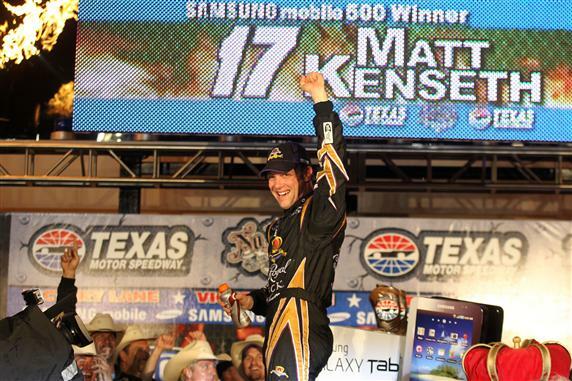 The victory was Kenseth’s second at Texas and the 19th of his NASCAR SprintCup career. Kenseth’s Roush Fenway Racing teammates Carl Edwards and Greg Biffle came home third and fourth, respectively, with Paul Menard completing the top five. Marcos Ambrose ran sixth and polesitter David Ragan seventh, as Ford drivers claimed five of the top seven positions. Jimmie Johnson, Dale Earnhardt Jr. and Kurt Busch completed the top 10. Kenseth, who led 169 of 334 laps, said staying out front in clean air was the key to winning the race. Long runs indeed. 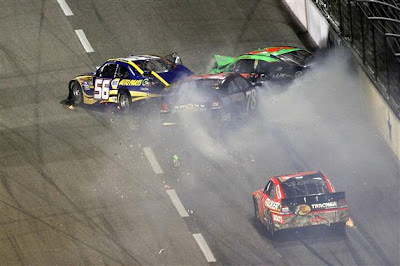 The race ended on a green-flag run of 114 laps, after the only violent wreck of the night caused the fifth caution of the race on Lap 215. Kenseth passed Bowyer for the lead on Lap 249, but one lap later, Kenseth relinquished the top spot when he brought the No. 17 Ford to pit road. With Kenseth bearing down, Bowyer had made a spectacular save a few laps earlier, after his car slid sideways as he tried to pass the lapped car of Brian Vickers. “Dang it,” Bowyer said. “That was my fault, totally my fault. You come up on those lappers, and they hold you up so bad. Matt started to catch me, and I was pressing, trying to get around (Vickers). He gave me room. I just slid up and got into him. Kenseth’s pit stop on Lap 250, necessary because his car hadn’t taken on a full load of fuel on the previous stop, started a parade to pit road that lasted 26 laps. Tony Stewart and Kurt Busch pressed the issue by staying out as long as possible, hoping for a caution. Busch pitted on Lap 270. Stewart waited until Lap 276, opening a fuel window that would allow him to finish the race without another stop—or so he thought. But Stewart was penalized for speeding on pit road and then ran out of fuel on the last lap, finishing 12th, the last car on the lead lap. Bowyer had just grabbed the lead after a restart on Lap 214 when a bone-jarring wreck on the backstretch sent the cars of Martin Truex Jr., Mark Martin and Regan Smith to the garage. Brad Keselowski checked up in front of Truex, who did likewise, and the chain reaction turned Truex sideways after slight contact from Kevin Harvick. Martin and Smith were innocent victims, but their cars were crippled nonetheless. Notes: Edwards regained the series lead by nine points over Kyle Busch, who finished 16th. Kenseth moved up six spots to third. … Earnhardt climbed two positions to sixth in the standings, his highest ranking since he finished second in the 2010 season-opening Daytona 500. … The 169 laps Kenseth led were 61 more than he led all last year. I like your commentary/analysis on the NASCAR Sprint Cup Series! Very well written! I was wondering if I could feature it on our auto community http://www.atomicreach.com/microsite/bumpertalk website. If you are be interested, please email me back at annettewong@atomicreach.com.